Here is Littera’s catalogue of codices. Before using it please read this post about why and how I am doing it. Tips on navigation: At the top of the screen, you will see two arrows on each side as “next” and “previous” buttons to move between entries. The application opens the first record by default, so keep going to the right. At the bottom, there are miniatures for each entry and you can search there directly for a specific one; by clicking on it, it will appear displayed above. You can also move between thumbnails by clicking and dragging sideways. Please note that, although we cannot be sure when each manuscript was made, with exceptions thanks to the information some of them contain on their colophons, entries are organised by year since, being a timeline, adding a specific date is mandatory. To partly solve this problem, the estimated century for each source has been also included within its file in green under the shelfmark. Content: For each record selected, on the left hand side of the screen you will find a representative picture of it – as long as it has been digitised or I have been able to find a digital surrogate with open copyright. I am still working on uploading all the images available so please be patient. At the top right of the timeline you will find the selected data for each entry: First, in pale grey, the date I had to use (as explained above), the shelfmark in bold, and the estimated date in green (century and year, if known). For fragments, if some come from the same source, a + with the other reference/s is/are included. Second, the contents of the manuscript; main work, author and title. Then comes a short physical description; the example in the pic above is the model, meaning that, as I work, each entry must have at least all this information. The next section, ‘history‘, has a note on what is believed to be its origin and provenance, with a link to its archive record for more information. The last or main bibliographic references are included below, with a hyperlink to the source if it is available online. Finally, the links to the digitised manuscript, if it exists. Some final notes: As far as I know, some of the information I want to include for each record has never been gathered before in one place, such as the online references and some details about physical descriptions. Once again, this is not yet a completed catalogue but a work in progress. If you think that relevant data is missing or that additional information should be included, please do let me know; I aim to make this resource useful for everyone. As I see it, the timeline can be used as a great tool not only for knowing how many manuscript sources written in Visigothic script are out there but also for having an idea about the evolution and characteristics (time and uses) of the script, as well as knowing about medieval best-sellers for specific periods, for example. But, it is problematic because you cannot search directly on it (only database editors can do that). If I were a user this would upset me. I would like to make the database open, but in the meantime, I adapted my database timeline to an Excel sheet to enable you to see the data more clearly, download it and use it as much as you want. The information contained in this sheet is currently very simple. 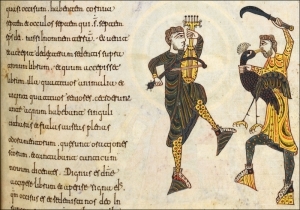 The first column contains the ID (359 manuscripts, codices or fragments in Visigothic script!!). The next column contains the country, archive and shelfmark of the manuscript, its estimated date (please note that within the timeline you can see this by centuries, what will be the correct way), and, finally, a brief note about its content. Once I have developed the timeline further, this list will be improved.